As fantasy owners we are almost always interested in the trades that happen between major league rosters. We get especially excited in the days leading up to MLB's Non-Waiver Trade Deadline. We want and expect to see big names and major loves that will radically change the face of Major League Baseball teams and the fate of our fantasy squads. Unfortunately the deadline deals rarely match-up with our great expectations. This year's deals were not an exception. By far the most interesting deadline deal was the three-team deal between the Boston Red Sox, Detroit Tigers and Chicago White Sox. The Red Sox gave up young defensive shortstop Jose Iglesias (to Detroit) and a trio of prospects ( infielder Cleulius Rondon and pitchers Francelis Montas and Jeffery Wendelken) and received starter Jake Peavy from the White Sox and reliever Brayan Villarreal from the Tigers. 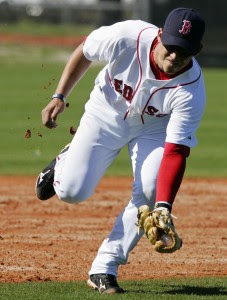 Chicago received the Boston prospects and young outfielder Avisail Garcia from the Tigers. Jose Iglesias is a good fit with the Detroit Tigers for a few reasons. If the Detroit Tigers have a weakness it is in their infield defense. Iglesias can provide the Tigers with Gold Glove quality defense at shortstop and even second and third base if necessary. Over the last few seasons, Iglesias has become a much better contact hitter with improved patience at the plate. It does not show in his walk rate but it does appear in his swing rates and his declining strikeout rate. Iglesias has close to zero power (2.2 HR/FB% and .079 ISO) but is becoming the type of player that can find ways to contribute (or at least not be a huge negative) in a lineup full of sluggers while contributing vastly increased defensive range. He still swings at too many pitches, especially outside of the strikezone. He is also unlikely to keep batting .330 or maintain his .379 BABIP but he should be able to hit for a decent average, at least for a power lacking defensive dynamo. Iglesias' most significant contribution to the Tigers in 2013 is likely to be as the player who replaces Jhonny Peralta during his coming PED suspension. Peralta has yet to test positive for anything illegal or against the rules at this point. However, Bud Selig is determined to punish anyone linked to rumors of wrong doing via the BioGenesis scandal. So in effect, Peralta is being punished for not testing positive while being linked to BioGenesis. No, it is not meant to make sense. Peralta is likely to miss most of the remaining season. It is possible he could be around for the playoffs but it is difficult to see that happening if Iglesias is successful over the next two months. Peralta is a free agent after the 2013 season and could very well finish his career with the Tigers watching from home.This could mean Iglesias is the shortstop of the future for the Detroit Tigers. The Red Sox were already in good shape heading into the season's last two months.They were playing well with a solid lineup, starting rotation and bullpen all contributing. The Red Sox also have a loaded farm system which is loaded with enough quality talent to allow them to deal their former shortstop of the future. But if you look closely you can see why the Red Sox felt they wanted another veteran starter. Jon Lester is their ace in theory but recently went through a rough period similar to last season's disaster. Lester seems to have recovered relatively quickly but he does not inspire great confidence in Boston fans nor the team's management. Clay Buchholz finally seems to be the ace-level starter he was once projected to become but his track record of success is not long and his recent shoulder discomfort is worrying. Peavy has a history of durability problems but was great in 2012 when he contributed 219 innings in 32 starts. Peavy is recently returned from a few weeks on the disabled list with a non-displaced fracture in his ribs. It is expected that this injury has contributed to a slight decline in his velocity relative to 2012 and some rust in his command since his return. But his elbow and shoulder are both strong and not an issue at this point. He has solid velocity in the low 90's and excellent control. He has a very solid strikeout rate and induces a fair number of ground balls when necessary but also allowed quite a few homers pitching in Chicago's homer friendly stadium. Fenway should be a little better for Peavy's stats and his fantasy owners. Most of all he has pitching experience that the talented youngsters on the team can use in this group's first run into the playoffs. The White Sox had and still have an aging roster and a high payroll that does not provide much bang for the bucks. Avisail Garcia is the best prospect the White Sox acquired but is still very much a work in progress. More than anything else the White Sox are looking to load up their farm system and clear payroll so that the new management team can rebuild the roster with younger and more cost effective talent. Garcia could see a small power boost playing in Chicago but his lack of patience and over aggressiveness will limit his impact on fantasy rosters and in the White Sox lineup. Garcia is only 22 years old so he has plenty of time to develop the skills necessary to become a solid major league outfielder. We can still expect to see some fairly big names moving during the waivers period. Alex Rios, Mike Morse, and Michael Young are some of the bigger names on the market and they could change the shape of some close races in both fantasy and MLB.